The Backorder feature is only available if the BackOrderReCalculateService is running on your server; please contact SellerCloud Support to confirm that this service is installed. In addition, Enable BackOrder Workflow must be selected in Client Settings to use this feature. 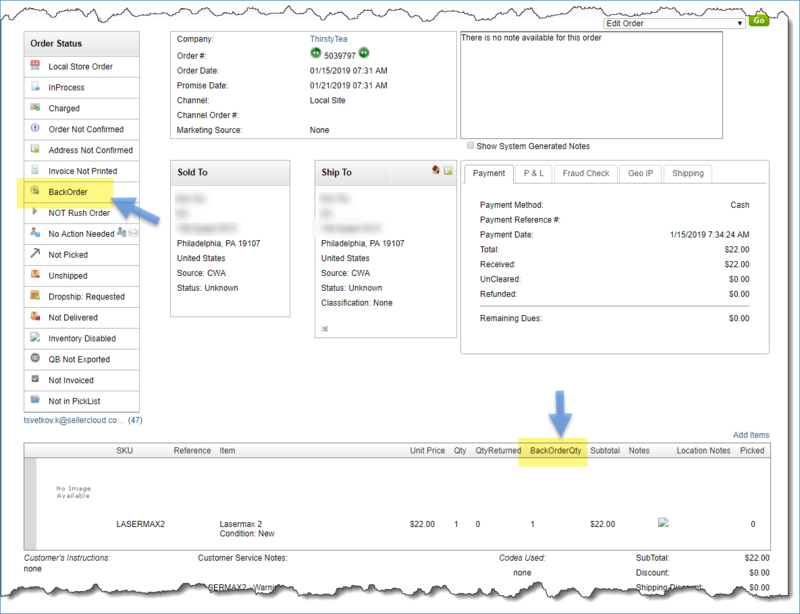 Read how to configure Backorder-related Client Settings later in this topic. SellerCloud can mark an order with a BackOrder status when a customer orders an item for which you have no availability. When this happens, the backordered quantity will appear in the Order Details' BackOrderQty column and the order is marked as BackOrder in the Order Status bar. When inventory does become available, the BackOrder Qty is adjusted and the Order Status is updated accordingly. Note that inventory is applied chronologically to orders, with quantity first becoming available to older orders. If you manually change the inventory of an item, you can easily force the recalculation of one or more Backorders instead of reallocating inventory or waiting for the BackOrderReCalculateService to rerun: On the Manage Orders page > select orders > Action Menu > Recalculate Backorders > Go. Open Manage Orders > Advanced Search > BackOrder dropdown field > choose Full BackOrder, Partial BackOrder, or Full or Partial BackOrder > Search. On the Manage Orders page - select the Backorder > Action Menu > Mark BackOrder or Mark Not BackOrder > Go. On the BackOrder Reallocation page > revise the Backorder Qty field > Update. Your changes will be overwritten when the BackOrderReCalculateService re-runs, based on quantity available and Backorder-related Client Settings. Menu > Customize Interface > GUI > Auto move orders with backorder items to the attention tab - This moves all Backorders to ShipBridge's Requires Attention tab instead of the Unshipped tab, so they are easily discernible as orders that are not ready to ship. Menu > Options > Scan and Ship > Ignore backorder/requires attention orders - This hides all Backorders from ShipBridge's Scan and Ship tab when entering or scanning those orders, so you will not try to ship a Backorder when you have no item(s) available in the warehouse. 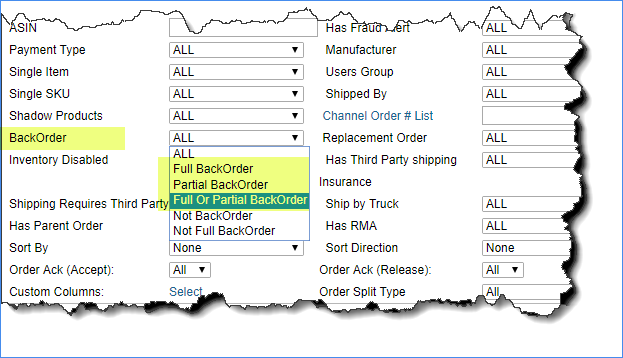 *Enabling this will deselect the setting Hide BackOrder Column in Manage Orders. It is assumed you want to see the BackOrder icon on the Manage Orders page; however, you can override this behavior by selecting it. Hides the BackOrder icon on the expanded Manage Orders grid and the BackOrderQty column on the Order Details page. You can use this when importing inventory from a vendor into a dropship type warehouse and you don't want this inventory to be considered as available. Instead, items are actually ordered on a PO, received, and shipped to the customer. Calculates Backorder per product, based on the Ship To warehouse set on the order. Note:This will not do the calculation for FBA, Interim, or Untested warehouse types. For example, an order for 40 items with 10 on hand and a second order for 10 comes in later. This setting will allocate quantity to the second order instead of reserving it for the first. It will try to do this for the oldest orders first. Click Add New Template and create an email for an order cancellation when an item is out of stock > Save Template. Company Settings > Toolbox > Email Settings > click Email Template Assignment. Here, you assign a specific email to send when encountering a given property. Scroll down to OutOfStockInventoryNotice and choose your order cancellation template > Update Grid. This email will be sent whenever an order is marked as a BackOrder.